A gift of $100,000 from Jean Langenheim, professor emerita of ecology and evolutionary biology, has established a new endowment in support of the UC Santa Cruz Arboretum. The endowment, "Strengthening Ties Between the Arboretum and Plant Sciences Faculty," is designed to foster more effective collaborative relationships between the Arboretum and UCSC faculty and students in the plant sciences. The endowment has two main areas of focus: supporting Arboretum staff to assist with teaching and research related to plant science, and funding exhibits and displays at the Arboretum to highlight the plant sciences research of UCSC faculty and students. "Jean Langenheim's endowment goes to the core of the Arboretum," said Arboretum director Brett Hall. "This generous endowment will foster tremendous learning and mutual support for research and conservation, while developing rich collaboration with the plant science faculty and graduate researchers. Jean Langenheim has long been a highly esteemed scholar, a leader in plant sciences, and an inspiring figure on campus. With this endowment, she is providing the magic to make good things happen." 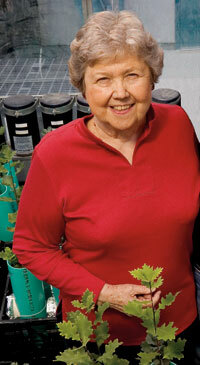 An eminent plant ecologist, Langenheim has been involved with the Arboretum since she joined the UCSC faculty in 1966. She worked closely with Kenneth Thimann, a renowned plant physiologist and founding provost of Crown College, who helped shape the Arboretum into an internationally known horticultural site. "Kenneth Thimann was very committed to the Arboretum and encouraged all the plant science faculty to use it as a resource for educational and research activities," Langenheim said. "This endowment is meant to reinforce and strengthen those academic ties." Although plant science is the primary focus of the endowment, it can also be used to provide support for faculty and students working with animals that interact with plants, such as birds and insects. The endowment will be administered by a committee that includes Arboretum staff and plant science faculty from Ecology and Evolutionary Biology, Environmental Studies, and other departments with faculty engaged in plant science research. Ingrid Parker, professor of ecology and evolutionary biology, will serve on the committee as holder of the Langenheim Chair in Plant Ecology and Evolution. "I'm excited about how this endowment provides a catalyst for creativity in our work. In discussions between faculty and Arboretum staff, we have already generated a dozen novel ideas for ways to build capacity and share the lessons of ongoing research with the community," Parker said. "Our Arboretum is not only a place with an exceptional collection of plants from around the world, it is also a vibrant community of people who are interested in plant biodiversity and horticulture. We all have a lot to gain from our interactions." Michael Loik, associate professor of environmental studies, said the Arboretum serves teaching and research needs not only on the UCSC campus, but for institutions throughout the world. "The Arboretum is a storehouse of tremendous biodiversity, and the staff is very knowledgeable, so people contact them for botanical samples for a wide variety of studies," he said. Previous gifts from Langenheim have established the endowed chair now held by Parker and a graduate fellowship in plant ecology and evolution. "Jean has been an amazing presence on our campus in terms of her contributions to the field of plant sciences, and her new endowment is one of many ways that she has given back to UCSC," Loik said.